“So, we ended up creating our first bus roping opportunity.” Nancy Griffin describes participating in an action protesting inaccessible public transportation. “You get a half a dozen folks in wheelchairs and somebody goes up to the door of the bus and says excuse me Mr. Driver, but you and your bus are taken and your passengers are welcome to leave,” Nancy explains. “But, while you're having this conversation… the other people are chaining themselves to the bumpers on the front and the back of the bus with titanium bicycle chains.” Nancy’s activism was part of her membership in ADAPT (Americans Disabled for Accessible Public Transit) in Tulsa, Oklahoma before she moved to Indiana in the 1980s. Nancy was an accessibility consultant when she was interviewed in 2009 about her involvement in Indiana’s implementation of the 1990 Americans with Disabilities Act (ADA). Nancy shares some context for how the ADA was first introduced in 1988 when the disability conversation changed to issues of civil rights. She reminisces about Justin Dart Jr. and his considerable impact in Indiana. “He was so compelling. And, you just couldn't say no to Justin.” She shares an anecdote about his (ultimately successful) attempts to influence President George H.W. Bush favorably towards the ADA. Dart had regular dinners with the President’s chief of staff. Dart selected restaurants where his dinner companion would have to carry him and then his wheelchair onto the premises. “Justin managed never to find an accessible restaurant in Washington, DC and they had dinner at least once a month for a year and a half,” she relates. Another anecdote explains how the categories of businesses named in the landmark legislation were created in the Congressional cloakroom, using the Yellow Pages. 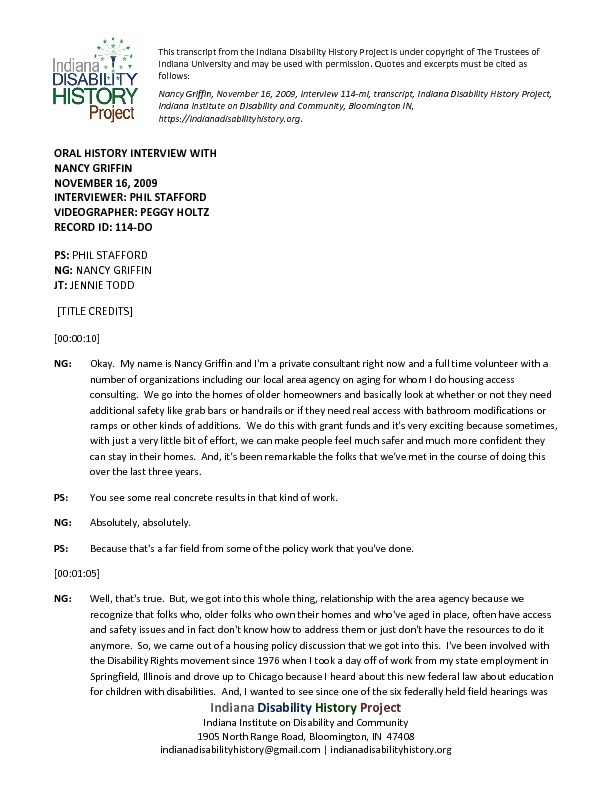 Nancy Griffin, November 16, 2009, interview 114-mi, transcript, Indiana Disability History Project, Center for Health Equity, Indiana Institute on Disability and Community, Bloomington, IN, https://indianadisabilityhistory.org.